I want these awesome camera reviews to be the main focus of this article, so all the text will be below the mosaic. As a result of a group project, here are 80 film cameras for under $50! And if you’re into film, be sure to check out my film photography blog. When I announced this project, I wasn’t sure what to expect for the level of participation. I asked for people to buy a sub-$50 film camera (or use one they already had), write a review of the camera, and publish an entire roll of photos from the camera. I was kind of hoping for 30 or 40 entries. But the community exceeded my expectations and surprised the heck out of me! We had all kinds of crazy stuff showing up: rangefinders, SLRs, TLRs, toy cameras, underwater cameras, point & shoots, box cameras, folding cameras, Polaroids, and even a 3D camera. 80 of them in just one month! I applaud your efforts — you guys are awesome! With all this enthusiasm for film photography, I feel like we’re on the brink of a film-revolution. It was great to see so many people picking up a film camera for the first time in years (or for the first time ever! ), and having such a good time with it. So if you’re ever looking for a cheap film camera — just go through the list above and I’m sure you’ll find something that sparks your interest. The photographers who participated in this project have essentially created a huge resource for other photographers that may be interested in film photography. How cool is it that ILFORD Photo and Lomography have sponsored this project to give away a Diana+ and 10 rolls of film to 3 winners!? These two companies are at the heart of present day film photography and it’s pretty awesome that they’ve taken an interest in our project. I’d like to offer my thanks and gratitude to both companies for joining us, and I encourage all of you to check out what they have to offer. I asked each of our two external judges to choose their favorite project entry — which is a daunting task with 80 participants! I’d like to extend a huge “thank you” to Jim Talkington and Udi Tirosh for taking on this role. Two of the three winners are shown at the very top of the list, and will each receive a complimentary Diana+ from Lomography and 10 Rolls of film from ILFORD Photo. And don’t forget to cast your votes for the third winner! Participation was amazing. Now, this is not your ordinary “shoot a pic and submit” kinda contest, it requires effort, discipline, and commitment. After all it is film and it takes at least one day to chimp. Not to mention getting a camera for less than 50 greens. It is not easy going through 80 entries so here is the process I used: I divided the submissions into 8 groups of 10, and browsed through each group, limiting myself for one or two selection per group based on general impression, first paragraph, and camera reviewed. I ended up with 12 reviews. I skimmed through the 12 and narrowed it down to three. that was not easy as there were more than three that actually were really good. It was a though competition between Nick Jungels’ Pentax K1000 review, Erick’s Marine XI, and Mr. Wolf’s Yashica SamuraiX3.0. The Pentax K1000 review was written right from the heart. It is packed with the technicalities that would interest me when considering a film camera like the viewfinder, the aperture ring, and “feel” of the camera. However, Nick is not just talking about the K1000, he is talking to the K1000, and for this he gets my full appreciation. The Wolf’s interview with Dr. Lomo was fun to read and was both amusing and informative. and earned points for “sucking up to the prize givers” (yes wolf it was worth it). The last review that made the final trio was the Marine XI. I could not resist a review that brings GAS in the first paragraph. This certainly got my attention. This along with the creative use of flash got Erick the winning vote. This and the Cohaagen-Give-those-people-air expression on the set taken with the camera. It’s been a great deal of fun getting to judge these entries. From the moment Brian first announced the contest I’ve been looking forward to seeing what readers would come up with and the results have exceeded expectations. This contest rocks, on many levels. 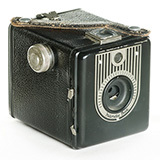 There was a great deal of diversity and many interesting cameras: toy cameras, half-frames, Soviet SLRs…you name it. And being totally honest, I always like a good bargain. Part of the intrigue would be seeing just how much camera could be purchased for $50. Just what bargains are out there? So it was with a bit of a personal surprise that I found my winner to be Janne in Osaka with the simple “Handy Box” box camera. Rather than seeing how much camera could be purchased for $50, Janne showed how little camera is actually needed to enjoy photography and create beautiful photographs. 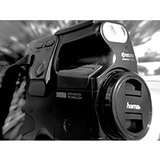 The text was informative, explaining the camera, company background and tips for shooting with the simple little box. And the photos sealed the deal for me. Shot in a variety of situations and obviously more than just a test roll, they were a pleasure to view. But the tech junkie in me still wants to buy a Zorki, Fed or Olympus Pen. As a runner-up I have to go in the other direction and point out the very unique Yashica Samurai half-frame camera (and equally unique review) from The Wolf Brigade. The little Yashica is about as high tech and over-engineered a $50 camera as you’ll find, a complete contrast to the little Handy Box. Long live the endless variety and possibilities of the $50 film camera! Again guys, thanks so much for judging this contest! [UPDATE] The official voting is over and all three winners have been awarded their prize — but you can still leave a comment about your favorite entry! Like I said, we’re giving away 3 prize packages. The first two winners have been chosen by our judges, and the third will be chosen by the masses. Leave a comment with your vote for best project entry. Look for those who put in the extra effort and/or got creative. You can vote by listing the entry number or the name of the reviewer — if you hover your mouse over the thumbnails, you’ll see this information show up. More than one vote is OK if you can’t decide between a few really good ones. One week of voting, then I’ll tally-up the points and announce the third winner. This entry was posted in Features, Film, Inspirational, Projects, Reviews and tagged camera, camera review, contest, Film, film camera, ilford photo, lomography, photography, project, resource, review on September 17, 2008 by Brian Auer. I VOTE FOR #7 – BRENDEN. Sorry I thought when you said vote for who did an extrodinary job, and if so many people agree with me that Brenden did and you’re going to call ‘shenanigans’ then what was the point of asking to people to vote at all? When you ask people to vote there’s going to be winners and losers. Why not just say “I’m going to pick who I felt did this best” instead of wasting all of our time by asking to go through everyones reviews and pick who we felt did the best. I just find it curious that all the Brenden votes started coming in at exactly the same time, and with almost identical text. The article has been out for over 24 hours, and prior to 11:30, Brenden had one vote. In the four hours after 11:30, there have been 16 votes for Brenden’s entry and they’re mostly the same text — “I VOTE FOR #7 – BRENDEN”. This doesn’t look a little off to you? I vote for #9, Chica! I’d like to vote for #46 – I thought the camera comparison was hilarious and creative. Many good entries; I can’t choose just one. There were a couple that did stand out to me – good pictures, good review and the tone and enethusiasm just plain made me want to get a camera like theirs. My Vote goes to #56 Golden Half. I love the shots from the camera as well! i vote for 66, Ani Castillo the cute Umi holdiing the camera you must to love her, and the story!!! I vote for #7 – BRENDEN!!!! Very good quality of both the reviews and photos, but my vote goes for #15 – The Wolf Brigade. The creativity on the post itself gives him the prize, but his approach to the half frame was amazing to look at. I want to cast my vote for Bren… just kidding! My vote goes to #24 Bob Simmons. Excellent, evocative pictures. I feel that it is probably too late for me to win, but all the same I would really appreciate if anyone cares to take a look at my entry (#27 Olympus Pen EES-2) and give me some comments, tips, everything. I know my review is kind of rough since my english is not very good (I’m a Spanish speaker). Last: Thanks Brian for the opportunity, I had a lot of fun! At this point in time, 19 votes for #7 – Brenden will be removed from the contest. Upon inspection of the raw access logs, it was determined that these 19 votes were made within several minutes of landing on this page from various livejournal pages (and first time visitors too) — certainly not enough time to even glance at all (or most) of the project entries. I’ll leave the comments on the page so this discussion isn’t confusing to future visitors. I apologize to my regular readers for the disruption. And I sincerely thank all those who have spent the effort going through these reviews prior to voting — it’s a huge task. 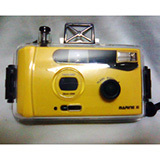 I have also Agfa Billy, but I can’t use I yet. It’s bellow is full of holes. I need to find some time to repair it. Great pics in so many of the contributions. I’m slowly going through the list and I’m already enjoying myself completely with the blogs I’ve read. Lots of great stuff and style. Good job, you all! everything looks so fine, but i cant find my review on this site did i did somthing wrong? there’s so many to choose from! but i’d have to say beier beroquick KB 135 by stephane heinz. Congratulations to the winners, and to everyone else for their reviews and effort. Thank you, Brian, for the great contest and facilitating something I’ve wanted to do for a while, and that’s write an instruction manual for my ancient Kodak folder. I thought I was going to vote for a fellow folder, but I have to vote #66, by Ani Castillo. I found the story to be entertaining and charming, and I like the snapshot aesthetic of her photos. Thanks Chica, for voting for my submission. Its nice to be recognized for hard work. And thanks to the 15 or so people who read my review..
Congratulations The Wolf Brigade! I knew it! I enjoyed a lot of good reviews here and yet I still have yet to read them all. But I can say that Wolf’s Brigade review made me want to find the odd-looking Yashica Samurai and buy it. (On my GAS list.) The Golden Half is my second choice for half-frame cameras. I also have to mention that #78′s Stephanie Briggs review for the Tura Underwater was very attractive. She did a great job creating a web page for it. I have a question though, do any of these cameras enable you to develop the film yourself? Like in a darkroom? I’m pretty sure all of them enable you to do that. You just need to have the right equipment, chemicals, and knowledge. I develop my own b/w film, but I still have my color film processed at a lab because the steps are a little more involved. Film Rocks! Film has a quality (don’t ask me to explain – I can’t) that digital does not capture. Its like the taste of fish for the first time – you know its different and good – but you can’t explain it.